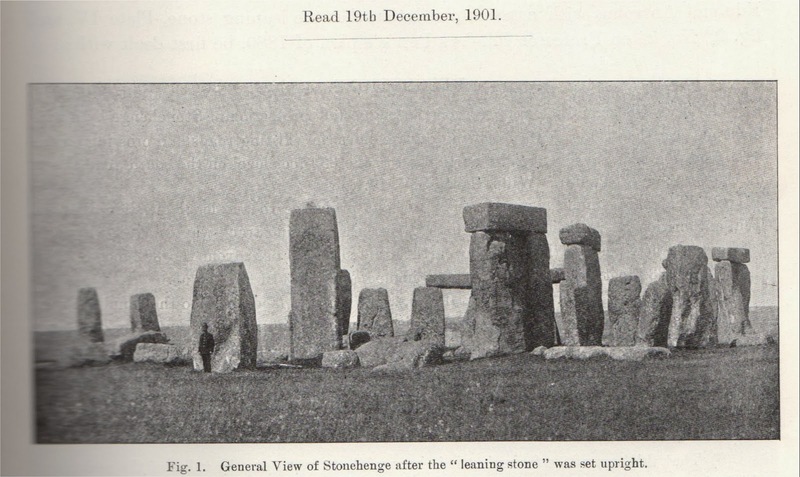 Was Stone 7 Straightened Pre 1901? Neil Wiseman kindly sent me some pictures of the wooden strut mentioned here, one picture is dated 1896 and the other from before 1901. Stone 56 is leaning and lintel 122 can just be seen peeping out from behind stone 16. As always I turned to my trusty Gowland - his report on his straightening of Stone 56. And Fig 1 shows no strut. So when was the strut removed and why? It looks to me as though stone 7 has been straightened a little. And if you were so afraid it was going to fall that a large wooden strut was constructed I think some remedial work would have been done before removing it. 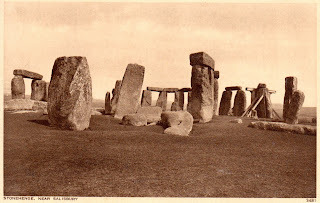 Later it had larch poles erected to help support it and then it was lifted and concreted into the ground upright in 1919-1920. 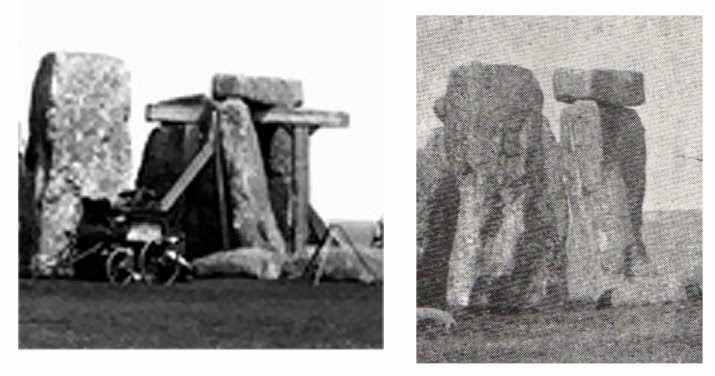 UPDATE: Analysis of the photos by Simon Banton and others leads them, and me, to the conclusion that the stone wasn't straightened, it is an effect of the different camera angles. UPDATE 2 : From Hugo Anderson-Whymark: "I was interested in this structure and had a few e-mails with Martyn Barber last year. 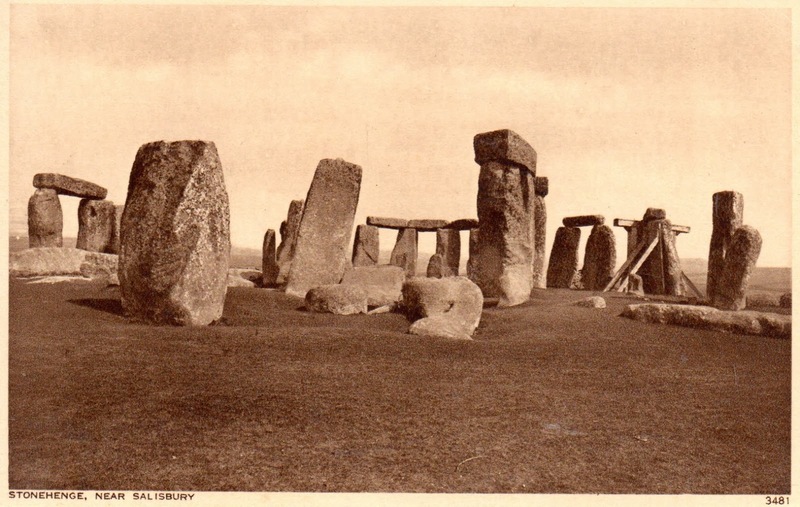 He told me that it was erected by JJ Cole, an architect, to ensure the stones didn't collapse before straightening (which didn't happen at the time) and the structure was removed during Judd's 1901 works. Apparently a visitor in 1881 described it as a 'gallows-like erection', as your photos clearly show. J J Cole was Antrobus's architect according to Rosemary Hill's Stonehenge and it was his suggestion that the monument was made safe rather than restored, and that work done was obvious. A very modern and enlightened view. 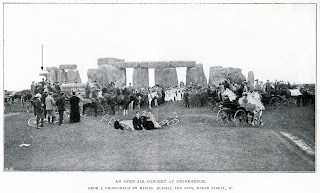 I have been trying to find a picture of the wooden strut - two legs and a cross piece that was erected under the lintel of the Stones 6 & 7 trilithon for some time, having just glimpsed it in a view from the North East taken in, I think, the 1890s. And then two turn up this week. Photo of Stonehenge, 1887 - Francis Frith has one as well. By the time of Sharpe's Aerial photograph 1906 it has been removed. 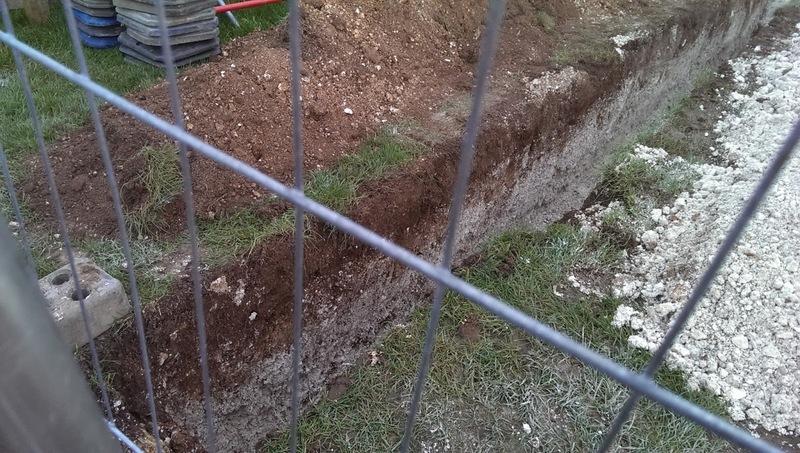 Periglacial Stripes in the old Stonehenge Carpark? I noticed today that as part of the demolition leading to the renaturing of the old Stonehenge carpark that a trench had been dug that I could see into. 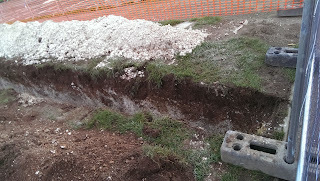 Obviously surrounded by safety barriers but the section seems to show ridges of chalk interspersed with clay filled dips in the subsoil. Looks like classic chalkland periglacial stripes at this casual glance. According to Cleal et al Wessex Archaeology found periglacial stripes near to this spot in 1988-89 but the report on the dig remains unpublished. 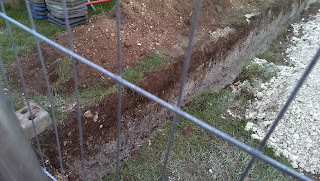 My construction of a working Long Barrow at All Cannings is going full tilt, which is involving a lot of press interviews as well as other work. Pop over to the website www.thelongbarrow.com or the facebook page for more info . A Ground Penetrating Radar (GPR) survey was conducted over a circular earthwork enclosure, known as Priddy Circle 1, one of a group of four similar scheduled monuments on the upland Mendip plateau close to the village of Priddy, Somerset. 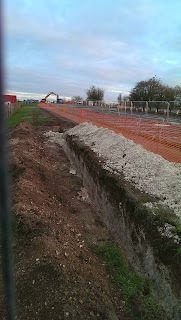 Following extensive levelling of the earth works and the subsequent prosecution of the landowner through the Ancient Monuments Act, a programme of mitigation work was agreed, including geophysical survey in advance of evaluation excavations to recover information and offset the impact of the damage. 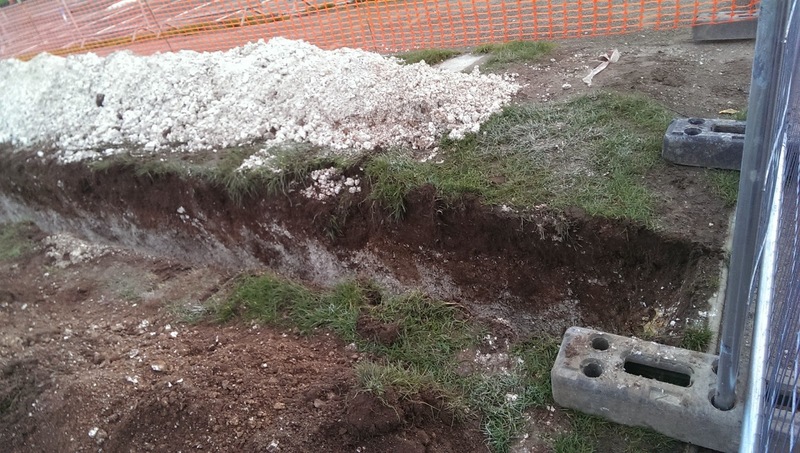 The site was surveyed using a vehicle towed, multielement air-launched GPR array to provide high sample density coverage of the monument to complement fluxgate gradiometer coverage commissioned separately. Due to concerns over the signal penetration achieved in the field by the air launched array a comparative area over the damaged earth work was also conducted with a ground coupled impulse GPR system, using a 450MHz centre frequency antenna. 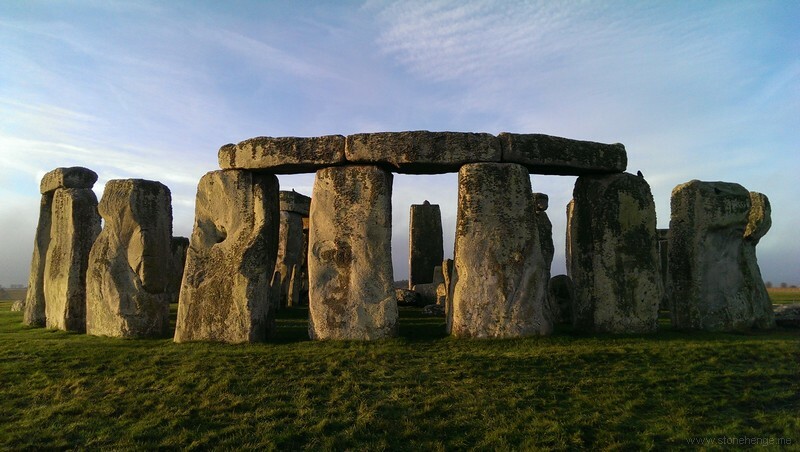 Archaeologists are gaining a new perspective on why ancient Britons erected great henge and circle monuments like Stonehenge. Recent studies emphasize how the work of building monuments brought geographically dispersed communities together. Surprisingly, the stone circles were part of a package of innovation that began in Scotland's far northern Orkney Islands and later spread south to transform the British landscape. Flight over Stonehenge Showing Parchmarks. This from our parch mark investigations this summer. 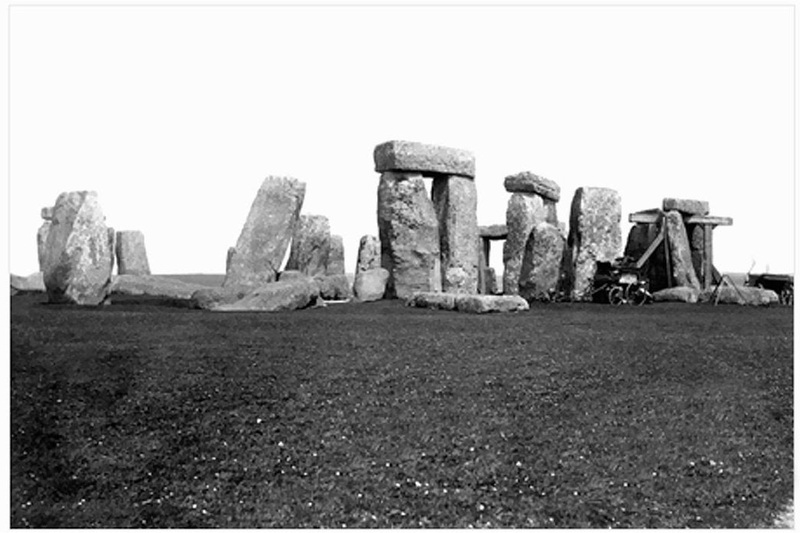 Bluestones and Stonehenge - Major feature in this month's Current Archaeology. Link will be added when available.